Capt. 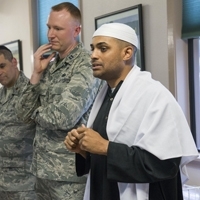 Rafael Lantigua, Jr., the first Muslim chaplain in the National Guard, has been explaining America to Muslims overseas, and Islam to Americans at home. Capt. Rafael Lantigua, Jr., the first Muslim chaplain in the National Guard, has represented America to Muslims overseas, and Islam to Americans at home. Rafael Lantigua became a Muslim the same day he joined the military. Today, he's a captain, a chaplain, and a master interpreter between troops who might not know much about Islam, and the men and women who share his faith. "Here's what the story's not about: I went in thinking it was a story about... the fish out of water tale of a Muslim who is a chaplain in the military, " says producer Paul Flahive, went along to Joint Base San Antonio to profile Lantigua. "But this is a fish in water story." Rafael Lantigua is a captain in the Air Force, a Muslim chaplain, and he also sits on the board of the Association of Muslim Chaplains. Paul Flahive is a tech and entrepreneurship reporter at Texas Public Radio. "You have to understand... the only time you meet people is when they're in great need and despair, and to respect that, and also to be humbled by it." We speak to two chaplains who have been working on the sharp end of their profession, in high-security prisons, and in combat zones. They share the situations they confront, the questions they're asked, and the ways their work has changed them. Reverend John Weatherly is a retired military chaplain and the rector of St. Mark's Episcopal Church in Alexandria, Virginia. Raqeeb Abduljabbar is a prison chaplain and an imam at Masjid Ibrahim in Sacramento, California. There's a particular kind of pain that damages the soul in war: moral injury. It’s a deeply human response to witnessing or participating in an event that is morally repulsive – from killing another person to handling human remains. In 2009, 'moral injury' was named by clinicians at the Department of Veterans Affairs as a possible consequence of combat. From 2012.